It is very rare that I use levered ETFs. The opportunity has to be striking. 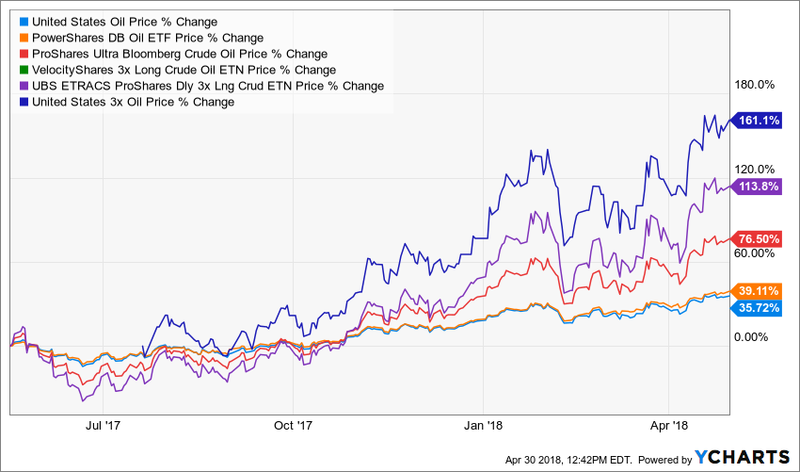 In most cases I greatly prefer options to levered ETFs due to the expenses related to levered ETFs and other structural issues. Right now however, there is a compelling argument to use a levered oil fund. Remember the fiasco with the volatility ETFs and ETNs from early this year. Well, here’s a dirty little secret. Every ETF or ETN that uses futures can have structural problems. 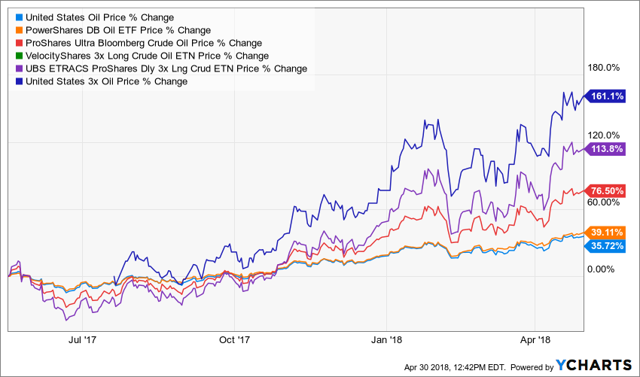 ETNs more than ETFS have problems, but both can suffer adverse structural symptoms felt by investors. I know people who invested in the United States Natural Gas fund (UNG) and just kept holding as it went down. Their idea was it’ll have to come up eventually. With these types of ETFS, levered or inverse, that’s not true, due to the way the futures work. I’m not going to go into all that today, but there are articles out there. Look for the terms contango and backwardation. As you can see, the U.S. 3x Oil levered ETF (USOU) is the clear out performer the past year. I believe we can see another 20-40% gain by July or so. While I prefer options on the non-levered U.S. Oil fund (USO), that is not available at Interactive Brokers in IRAs so I needed a substitute. Also, many people just don’t use options. So, here is the trade. I am buying some USOU. Only 1-3% for now of portfolios. I will add on dips the next two weeks going into the May 12 announcement on the nuclear deal with Iran and get up to 3-6% of account value by then. If President Trump does not bring back sanctions on Iran and does not end the nuclear deal, I will sell this ETF IMMEDIATELY as there will be a drop in oil price that likely lasts until summer demand numbers come later on. If President Trump does in fact end the nuclear deal, I will likely double my position to 6-12% temporarily. The exit strategy is to wait until July sometime and sell into the rally as oil gets to around $80 per barrel. Let’s talk in the comments below so folks can follow along. Additional disclosure: I own a registered investment advisory but publish separately from that entity for self-directed investors. Any information, opinions, research or thoughts presented are not specific advice as I do not have full knowledge of your circumstances. All investors ought to take special care to consider risk, as all investments carry the potential for loss. Consulting an investment advisor might be in your best interest before proceeding on any trade or investment.